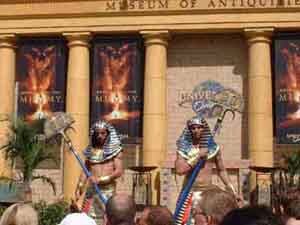 Ride like an Egyptian with this look at the ride's opening ceremonies, plus a ride review. With photos! What do flesh-eating scarabs, and indoor roller coaster, and a 3,000-year-old curse have in common? 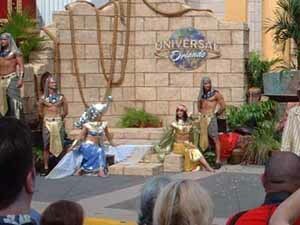 They're all a part of the new Revenge of the Mummy at Universal Studios Florida. The new hybrid attraction was officially opened to the public today, May 21st, but I was fortunate enough to be there Thursday morning, May 20th for the grand opening media event. A number of Egyptian guards and princesses entertained the audience while music played. We were eventually greeted by an old archeologist character who announced that it was time to break into the resting place of Imhotep, but the wall was rather impeding progress. 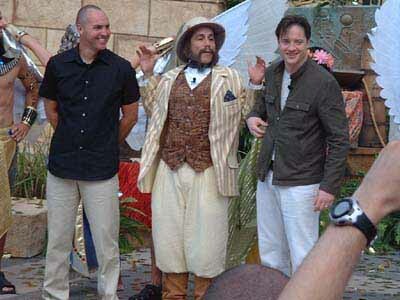 To stall, the archeologist introduced the mummy himself, Arnold Vosloo, who led the crowd in a rousing chant of "Im-ho-tep. Im-ho-tep." As our host tried to figure out how to break in, an evil priest suddenly appeared, exclaiming that no one would experience the ride. Naturally, the villain was wrong, as up above we see Rick O'Connell with enough dynamite to blow the entrance open. 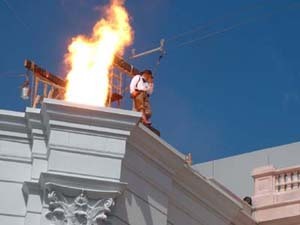 There's a small explosion and the stunt O'Connell is set on fire as he rides a zip line down to the front of the attraction. Then there's a series of larger explosions--fireworks, smoke, fire and confetti. When it's all over, we're greeted by none other than Brendan Fraser, who invites us all to join him and Vosloo for a ride. Upon entering the building, we find ourselves on the set of the new Mummy movie. Video clips on monitors tell us, through a mock-umentary, that despite all the Hollywood magic, there are members of the crew that take the curse VERY seriously. Many of them wear the symbol of the Med-Jai, the symbol of those warriors that protect 'the Creature' from being found, lest it be raised from the dead. In the video interviews, Fraser dismisses the curse as some hokey nonsense. Naturally, being the adventurous thrill seekers that we are, we don't pay much attention either. Deeper into the queue we go, encountering a number of interactive artifacts along the way--items possibly from actual tombs? Perhaps unearthed and brought on the set of the movie to make it look more authentic? Whatever the case me be, the props seem to do the trick. Not only does it look like we're wandering through an ancient Egyptian tomb, but it looks as if there may be more to this curse than meets the eye. A quick jaunt up a flight of stairs brings us to the loading area, where Med-Jai guards take us to our mine carts (the carts seat sixteen guests: four rows, four riders to a row). Two loading stations are available to expedite the loading process. The ride takes us through a mummy-infested tomb. We quickly discover that these mummies are tourists and have been recently mummified! As we turn the corner, we find one of the crewmembers wrapped up, trying to warn us that the curse if VERY real, but we realize it's too late as the mummy bursts forth from his sarcophagus. In the next room, Imhotep's face appears on the wall, and he makes us an offer: join him and receive vast riches or refuse and face a fate far worse than death. One moment, the room is lit up, full of chests of gold. The next moment, there are flames and six of Imhotep's guards suddenly surround the mine cart. We barely make it out of the chamber, dipping under a heavy stone slab. Suddenly, we've reached a dead end--and the room suddenly begins to fill with flesh-eating scarabs. Then, our mine cart rolls BACKWARDS and down a small hill. We briefly see the symbol of the Med-Jai before Imhotep's grotesque face appears again to taunt us. Our cart rotates around and the dark ride portion ends and the roller coaster portion begins. With a fierce cry ("You're souls are MINE! "), we are launched into the mouth of the mummy and into complete darkness, chased by evil spirits the entire time. The ending can be divided into two halves--the first half involves a phony exit station, which is a clever concept, and the ceiling becoming engulfed in flames. The second half, however, I will not divulge so as to let you folks figure out how it ends. 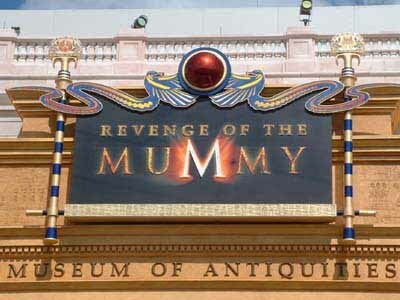 So, does Revenge of the Mummy live up to the hype, or is the attraction totally UN-dead? It's rather hard to say. The ride has some really fine points and commendable moments, but there are also a number of points where the ride could find some improvement. The theming for the attraction is done very well, but confusion sets in right from the start. Are we on a movie set? Didn't we enter the 'Museum of Antiquities'? Are we now in a REAL tomb, or a FAKE tomb? A lot of this can likely be explained by watching the mock-umentary in the queue line (and chances are, you'll have a really good opportunity to do so). Once on the ride itself, it's easy to assume that the remainder of the attraction is a combination between Egyptian tomb and supernatural realm, but the real world movie set suddenly comes crashing down in the end and it's hard to say how or why. What the ride lacks, more than anything else, is a sense of closure. When it was all over, I was left with a sense of wanting. While the roller coaster portion may not feature anything close to the caliber of Hulk's high speed or multiple inversions, the launch is nice, and there's real good hang time throughout the coaster portion. What makes the thrills unique, however, are the dark ride elements of the first half and those integrated into the coaster finale. The attraction creates a unique atmosphere in the beginning. Revenge of the Mummy has been dubbed a Psychological Thrill Ride, and in many ways, the title shines through. In truth, most theme park attractions utilize psychological elements to heighten the excitement. Different combinations of water and heat, wind and sound, lighting and pitch black darkness all combine in different ways to directly or indirectly cause sensations of fear and excitement. The human mind is easily fooled, but Revenge of the Mummy does this with full intent and offers no apologies. Of all the special effects in this ride, the animatronic mummy blew me away. Imhotep hadn't been in place during the technical rehearsals, but seeing this animated figure alone was absolutely incredible, with fluid, realistic movements and it's interaction with the animatronic mummified crewmember is equally impressive. I was, however, disappointed that the large mummy warriors that appear on both sides of the cart in the treasure room aren't animated. The speed in which they appear is great, but their frozen poses make them appear less threatening than likely intended to be. I was rather apprehensive of encountering the scarabs at first. After a few test rides, I'm beginning to think that the experience with the bugs could stand some additional tactile effect to really achieve a level of creepiness. A combination of video, moving set pieces, water and audio make the encounter tense, but no worse beyond that. Safety is a major point for many theme park attractions. Each seat has its own individual lap bar--but these are not standard T-bar lap bars. Rather they are connected to duel-arms that fit securely on both sides of the legs. I personally felt well contained and safe from harm, although the bar assured that there was no escaping the mummy and his minions! Perhaps my only other safety concern regarded the queue itself. Originally, Kongfrontation had a series of sloped pathways that brought guests to their second story loading area, but it seems the only way to the loading area is up a set of stairs. Whether this was done to make more room for the coaster itself is uncertain, but in the themed lighting, which flickers frequently, it could make it dangerous for guests ascending the stairs. On a TPI scale of 0-10, it is with great difficulty that I give Revenge of the Mummy a very, very, VERY high 8-Commendable--just a scant hair away from a 9-Outstanding. Small details here and there cause the overall grade of the ride to suffer, but if Universal were to decide to make some changes here and there to some of the effects and bring about a nice, sturdy conclusion, they could have a real winner. Don't be mistaken, a lot of hard work went into the design and build of the attraction and I enjoyed myself thoroughly. 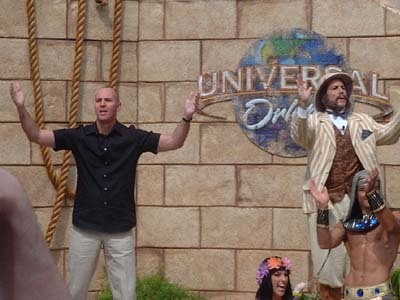 My thanks go out to the Universal Creative crew and Scott Trowbridge, VP of design and creative development at Universal--as well as Stephen Sommers and his crew. 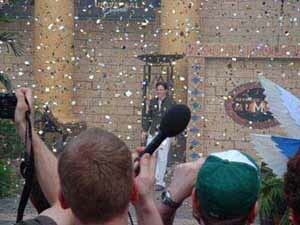 Make no mistake, Revenge of the Mummy is the feel good ride of the summer... and, uh, that's a wrap! Until next week, folks, keep on ridin'! Well, now we finally see the differences between the two rides. It appears that the two rides start much the same, though it is a grave robber that warns you to split in Hollywood, rather than the crew member in Orlando. And the dead bodies in Hollywood are supposedly other grave robbers - not tourists. The big changes happen after the treasure room and the guards dropping onto the cars. The moment of the drop is when the coaster launches (forward) in Hollywood. And the scarab invasion scene happens in the between the two coaster segments, instead of the false exit scene you got in Orlando. The car rotates back to forward at the end of the second coaster run in Hollywood, and that is where we will get the fire effect here on the west coast. It's good news to have an attraction clone that is similar only in theme and not in design. Looks like I'll have to make an effort to plan a trip to California one of these days. Great report, i cant wait till Dec. to ride this!!!!! I was able to ride during technical rehearsals on May 14, which was a nice surprise. The theming is excellent, and you need to ride quite a few times because there is so much to take in. Our first ride was ruined by a group of screaming teenagers behind us, which made it impossible to follow the story as you walked through. The only portion of the ride that made me a little uncomfortable was the intensity of heat when the tomb burst into flames near the end of the ride. This is a "must" attraction at USF!!! Nice review. I look forwards to doing this ride next year. I'd also be interested in seeing a review from a family viewpoint. How suitable is it for 11 year olds? The family-friendly nature of the attraction is roughly on par with rides like Earthquake or Jaws. The ride has a creepy atmosphere and preys on folks with natural fears of fire, bugs, darkness, and feelings of being out-of-control. It's hard to judge the reaction of a sixth grader on an attraction like this--some kids will brave the ride more than adults would. As for the roller coaster portion, the ride reportedly reaches a top speed of 40 mph, which is just a little more than the top speed of Disney's Big Thunder Mountains (no jinx). The music, the strobes and wind in the darkness simply makes it feel like its moving much faster. And there are no loops or corkscrews, either. How long was the line? On family-friendliness, my six-year-old daughter's begging me to take her on the Hollywood version when it opens. But she steadfastly refuses to go on the Dragon ride at Legoland California, which is the closest thing to a no-thrill junior verion of Mummy that I can recall. Apparently, she's got no problem with mummies, but dragons (even Lego ones) freak her out. In short: Kids are different. I just tell 'em what a ride's about, give 'em some time to think about it, and always respect their (often changing) wishes. I can't judge line length by the press event, only a select few folks were allowed on, but during technical rehersals, I think the wait time ran about 45 minutes. Now that the ride is officially open, I think it'll take a lot longer. I once waited for the new Shrek 4-D for an hour and a half (just to do a review). Mummy's lines may be even longer as it's less of a 3-D show and more of a ride. 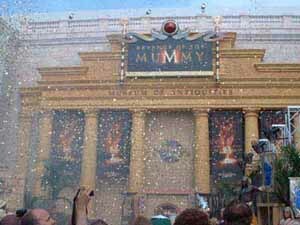 Today, May 23rd 2004 I was able to finally take a ride on the ever-talked about Mummy Coaster at USF. I was not lucky enough to get the VIP invitations, but still, we had a wonderful time. So wonderful we made it a point to ride it a second time. When we arrived at USF we qucikly took one of the LAST Express Passes for Shrek 4D, (It was only 11am) and headed to the Mummy. All of the express passes had been distributed already, so we opted to just wait in the normal line. The Que waiting time showed 60 minutes, however we were on the ride in just under 25 minutes. (this went for the second tmie as well, where the time showed a wait of 35 minutes). Personally, it looked to me that they were not done with the total themeing process. But, what you can see now it awesome. Both times we went through the que, we noticed different things, so you do have a lot of stuff that will grab your attention. The ride itself started off slow, but quickly picked up to an expected pace. I would say that you should make this a must see/ride event in your visit. It will not dissappoint you. Shrek 4D on the other hand, I dont know that I would have enjoyed the show if I waited the 90 minutes that the que line clock was showing. We had an express pass for the 4:45 show. I enjoyed the show, but I think I had higher expectations for it. The pre-show area was actually a better show! We plan to go back again next weekend and see how it does for memorial weekend. Is the ride going to be open at Universal Hollywood in the summer? June 25th. Read Robert's column here. Overall, this is a nice ride. The coaster elements are enjoyable - not quite as intense as Hulk or Dueling Dragons however. It begins with a nice reverse then moves to a great launch into the Mummies mouth with fairly good hang time. I thought the scarab beetle room effects were done well. The effect was simple and not believable but still very entertaining. The "brain fire" effect was done very well also. Granted, it is not "just inches" like the promos claim - it is more like "just about 15 feet." But I would not want it any closer, it felt like it was going to burn off my eyebrows already (gives me extra appreciation for fire fighters). The robotic mummy in the beginning was superb - probably one of the best animatronics out there. He was fluid, made multiple motions, spoke, shot out light from his hand, etc. - kudos to whatever team was in charge of him. Special recognition to the queueing area. The queue is SUPERB. It is highly themed, mostly indoors, filled with videos to watch, traps and tricks, etc. EXCELLENT queue. There is not much that is overtly bad on this ride. Sure the storyline made utterly no sense or reason about it. But, afterall it is just a ride, not a novel. However, the lack of any logical sense did take away from the ride and did not give you the nice, well-rounded feel that Spider-Man gives you. The basic idea is that you are touring the filming of The Revenge of the Mummy (a new mummy movie, I think) in which the crew took extra special care to use actual artifacts (albeit cursed ones though)from the tomb of Imhotep (bad mummy guy) for authenticity. The very entertaining set-up video explains that the filming has been plagued with accidents and the crew is starting to get freaked out. 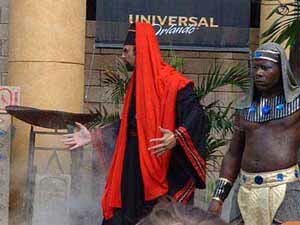 From that point, however, the ride is basically Imhotep wreaking havoc on you and basically it just ends after he has used all of his tricks. It seems that the storyline planning meeting broke early for lunch after someone said "Hey, let's jus' have the Mummy do cool stuff to people." In addition, the giant glowing mummy heads that light up and shoot smoke during the coaster portion were a little cheesy - like something one might see at a carnival horror ride. ROTM spends all of this effort to make the coaster pitch black only to light it up with these stupid looking mummy heads. I can only hope that the track needed to be lit up because people would lash out their necks or something. I only have one thing for this section - the really bad. The mummy warriors that pop up in the beginning. VERY BAD. These mummy warriors were extremely cheesy looking. They do not move and just sort of bobble there looking extremely ... well... poorly thought out. Come on, Universal, you spend millions to create these great effects only to start off with great dissappointment. The mummy warriors sort of taint the entire ride with cheese. Overall: Very fun ride with definite re-ridability. Something needs to be done about the mummy warriors in the beginning however. The ending is kind of anticlimatic. WARNING RIDE SPOILERS. Fraser just apears on a screen and gets killed by a mummy(witch was the cool and funny part after being handed his coffe)but nothing big like the big ending. I would also have to agree with anyone who said that the six warrior mummy's are cheesey. If they just moved a little bit and had diffrent color strobes on them, it would give the illusion of more motion. oher than my picky complaints this is now my favorite ride at Universal Orlando. Not to mention that Kongfrontation was my old favorite. Thanks for reading. I have been reading a lot of Mummy stuff online and those cheesy warriors pop up in almost everyone's review. Hopefully this will just continue to the point to where Universal HAS to change it. Right Kevin those are chessy. The attraction itself is a big improvment toward Universal. I loved it. I love it because its speed. I loved this ride its somthing you can go on again and again. The basic story of the ride is that a new Mummy film is being shot on location in imhoteps tomb and the cast have all been given ancient amulets which protect them from the curse (which is somthing you do not have the pleasure of having). Your role in the new film is to play a group of extras following a string of mishaps and strange accidents. In responce to the discussion on the "cheesy" mummy figure early on in the ride i do not feel that they take anything away from the ride as they are not really cheesy the only problem is that after your first time round the element of surprise has been eliminated so you know exactly when they pop up, but even then they are only there for a few seconds before you shoot off to the next section of the ride. So overall i think ROTM is a really fast paced ride which can appeal to anyone visiting the parks, and a vast improvement on its predecessor kong with more pace and thrills. My comment was on Halloween Horror Nights 2005 @ Universal. My husband and I went, we had a good time. But I felt like my age group was like 15% of the many teens and 20 somethings crowd. Everywhere's you look they were promoting liquor and beer. I thought it was way too adult for young children. It was basicly a big out door bar. We did have a good time, but alot of drinking. And don't take me the wrong way, I drink. But young children shouldn't be allowed to go.